Did you pass as a Canadian, eh? https://ontariotraining.net/wp-content/uploads/2019/01/OntarioTrainingNetwork.png 0 0 Colin Watson https://ontariotraining.net/wp-content/uploads/2019/01/OntarioTrainingNetwork.png Colin Watson2014-12-03 11:49:382017-02-22 08:58:08Do you speak “Canadian”? Do you know the percent of time Canadian Managers spend involved in resolving employee disputes? The article and survey published in HR Reporter, and conducted by Accountemps puts it at 16%. Our one-day workshops on Resolving Conflicts in the Workplace gives insights into how to be more efficient in handling this, thus freeing up valuable management time, helping to strengthen relationships, and improving future productivity. The Toronto Star featured an article on the five steps to reducing conflict in the office. It states that dealing with conflict in the workplace takes up a huge chunk of time managers and employees could be using more productively. Profit Magazine identified the top four tools the top 200 fastest growing companies use. Two of these are where J Watson Training can assist your organization. Take two minutes to learn a valuable lesson in communication. The subject line of an email is critical. I can make your message stand out and be read widely or be overlooked. Your word choice impacts your readers’ buy in to your message. Nike came up with an award winning slogan for selling their sporting goods in 1988. But as much as Just do ithas worked wonders for that company, if you are given a project and told to just do it, you should think again. Every year, thousands of world-wide projects end up in jeopardy because of a universal tendency to try to rush into the execution phase before fully defining and planning the what of that project. Before just doing it, a project definition document (often referred to as the project charter), must be prepared. Once the project charter is completed and approved, the project plan must be prepared in detail to ensure successful project execution. Describe the context of the project and the justification for doing it. Are there any strategic, operational improvement or regulatory reasons why this project must be done? This is the kind of information that tells stakeholders the why of the project and engages people to step up and deliver. 2. What are the main objectives? Describe in a SMART way (Specific, Measurable, Achievable, Relevant, and Time Based) the major objectives to be achieved with this project. 3. Who are the key project stakeholders? Determine the individuals, organizations, customers and clients that will be positively or negatively affected during the project or as a result of executing it. 4. What is the scope of this project? Record the major items of work to be done on this project at a high level. Also, list the major items of work that should be excluded from this project. This ensures clarity around the scope and prevents incorrect assumptions about what is included in scope. 5. What are the major project deliverables? List the major deliverables to be produced within the scope of this project. Deliverables are usually tangible items such as the end result or end product of your project. For example, if you were doing a project to create a new employee safety policy the final deliverable might be the policy document. A deliverable leading up to the final deliverable might be research into best safety practice. Typically, there are about four or five deliverables including those leading up to the final deliverable. 6. What are the project’s critical success factors? List the factors having potential or real impact on the success of this project. Often, if these factors are not in place, they could potentially stop the project altogether. Typically, there are only three or four of these factors. An example would be the availability of a key resource. 7. What are the assumptions and constraints associated with this project? Identify the assumptions and constraints (external or internal to the project) that need to be taken into account when establishing the detailed plan. Assumptions are things considered to be true for planning purposes. Constraints are factors that will limit the project like resources or funding. 8. What are the major risks associated with undertaking this project at this time? Identify the potential risks with the implementation of the project. Risks could be things like new technology not being available when required — thereby delaying implementation. 9. How will project changes be managed? Determine and document how changes will be managed. Address things such as the use of a change control template, a change control log, whether the original project charter must be revised, etc. Be sure to specify who has authority to approve changes to scope. Having this process in place will discourage unnecessary changes to the project and ensure that necessary changes are handled effectively. 10. What are the potential benefits and the associated costs of this project? Describe the benefits of this project, including things like revenue growth, customer retention, internal cost-reduction, and employee retention. Also, be sure to list the costs involved — including capital investment and any additional expenses. If you follow this guide, you will have the foundation on which to build a successful business project. Prepositions are words that show the relationship of nouns and pronouns with the other words in a sentence. Some examples ofprepositions are in, on, of, by, with, to, into, between, up, off, between, to and for. Sometimes, prepositions are unnecessary and can be easily removed. Poor: Where is she at? Poor: The shift is now over with. Better: The shift is now over. However, some prepositions are essential as they change the meaning of a word. The following is a list of the most commonly used words with their necessary prepositions. Emails in the workplace can be irritating. They are either too long or too abrupt. Blaise Pascal, the mathematician, once said, “I made this letter longer than usual because I lack the time to make it short.” I think today you can easily substitute the word “email” for “letter.” Too many writers have a knee jerk reaction when it comes to writing emails. They reply without thinking, often pouring out details without distilling them for the reader – causing the reader to have to sort and to interpret information and next steps. Alternatively, they write so quickly that the tone of the message appears dictatorial and irritates the reader. 1. Begin at the end. What do you want your reader to do once he or she has finished reading your message? That is your opening line. Remember emails should never be organized the same way as letters. Why? Readers tend to read the first paragraph of a print document to see if it interests them. Next they skip to the last paragraph to check if there is an action request. Then they read the middle paragraphs if they are interested. But that’s not how they read emails. With emails, receivers read the first paragraph (often in preview mode) and then keep reading until they are bored or think they understand the message. You cannot be sure your reader will even get to the last paragraph. Ideally, the last line of a letter – assuming you are not using that useless cliché — if you have any further questions, please don’t hesitate to contact me – should be the opening line of an email. In other words, begin with your action request. Then follow with the reasons why you have made the request. Most people prefer the 2nd opening. It tells them why they need to read your message. Use the word “so” to check your opening lines. If the reader can say “so” after reading your first sentence, you probably need to do a rewrite. 3. Don’t dictate. Too many email writers believe that if they add the word “please” their readers will consider them polite. For example, they might write: “Please send me the figures by Friday.” However, they forget that the inner voice they use when writing the message may not be the same inner voice the receiver uses when reading the message. The voice inflection is not there. Your request may seem polite to you but to a reader having a bad day, it may come across as demanding and condescending. I suggest you take an extra minute and precede your request with an explanation such as, “I am working on the annual report. Therefore, can you please send me the figures by Friday?” I know this may seem tedious but I guarantee you will get greater buy-in by treating your reader as a team player instead of as someone you have the right to order about. Note: The more personal pronouns and active voice sentences you use, the warmer the tone. And the more reader buy-in you get. 4. Don’t intimidate your reader with lengthy paragraphs. It is 25 per cent harder to read from a computer screen than from paper. Make it easy on your readers. Keep paragraphs less than five lines long and leave a blank space between paragraphs. First paragraphs should be shorter. Do not indent paragraphs or justify the lines. The best font is a sans serif one such as Arial, Verdana or Calibri. Emails with long, unnecessary threads. Jane Watson is a trainer, author, and consultant in the field of written business communications at Ontario Training Network. Emails@Work is one of her highly popular workshops. PowerPoint is a wonderful tool. But like many things, it can be overused. I use PowerPoint in my writing workshops that usually have a minimum of 20 people. And I generally follow the standard guideline of no more than six words across the line and no more than six lines to a slide. My font size rarely goes below 28. Occasionally, I’ll slip in a humourous slide to keep things lively. When I use PowerPoint, I stand in front of a group and speak to the points. Although questions are encouraged, the purpose of presentation is not to create a dialogue with one or two individuals but to provide information to a multitude. But what if your purpose is to brief a senior manager or to put forth a proposal to a small committee? Standing in front of a person or a small group and addressing them through a PowerPoint presentation is overkill and can make you feel uncomfortable. Hence Slide Deck. Slide Deck enables you to deliver your message in a more persuasive and efficient manner. In fact, the word “tool” is probably a misnomer. There is no equipment – just you and your package: sheets of paper. And you sit down at the boardroom table with the people you are trying to convince. I provide everyone with the entire package immediately so they can add their notes or questions as we discuss the topic. And “discuss” is the operative word here. I am not lecturing. The session becomes much more interactive as we are sitting together working through the information. Learning improves and no one has a chance to fall asleep. Although I often use the PowerPoint application to create a slide deck, the slides look quite different from those shown electronically. With PowerPoint slides – because of the size of the group – the font is large and points are presented in a linear fashion. Less is best. It’s the opposite with Slide Deck. The more you cram on the page the better. The font size can be much smaller – normally reading size. Remember, the key point, the four “squares” and the summarizing point are all on the same sheet of paper. I have covered on one page what I would normally need 4-6 PowerPoint slides to reveal. My next sheet would start with the key point “Effective Business Writing Relies on Plain Language Writing.” The squares below would cover the definition of plain language writing, the characteristics of today’s readers, what readers want in a business document, and the steps for plain language writing. Again followed by the summarizing principle. I have reduced the presentation by another 4-5 PowerPoint slides. I also find that it helps to number the squares of material on each page as well as the pages themselves. This allows me to quickly answer questions: “You’ll find that point covered in square #2 on page 4.” You’ll also increase your chances of reader understanding by anchoring some of the squares with supporting graphics. For example, when discussing emails and letters, I’ll add artwork for hamburgers and ice cream cones to the appropriate squares to reinforce the differences in the two communication forms. Slide Deck is a powerful tool for me when briefing senior managers or when making a sales call. It allows me to discuss issues, build a relationship, and leave an impressive package the receiver can refer to later. For a larger audience, a traditional PowerPoint approach works. Jane Watson is a trainer, author, and consultant in the field of written business communications at Ontario Training Network. She teaches Slide Deck in some of her standard writing workshops. At a recent workshop, one of the participants had a hard time with the idea of brevity. He had been told by his manager that his reports were too short. Therefore, he was looking for tips on how to pad his sentences with extra words. I read over some of the documents he brought and found the writing style acceptable. I believe the man was confusing his manager’s comment with content and not context. Context is all about the writing style: your word choice, sentence and paragraph length, and tone. It’s the way you deliver the message. Content is about the message itself. When we say keep business writing short and simple, we’re telling you not to use a lot of words to deliver a message — the context. However, I think the manager was asking the man to provide enough “meat” so the reader has necessary information to understand the topic and to take any required action. How do you decide the right amount of information to provide? 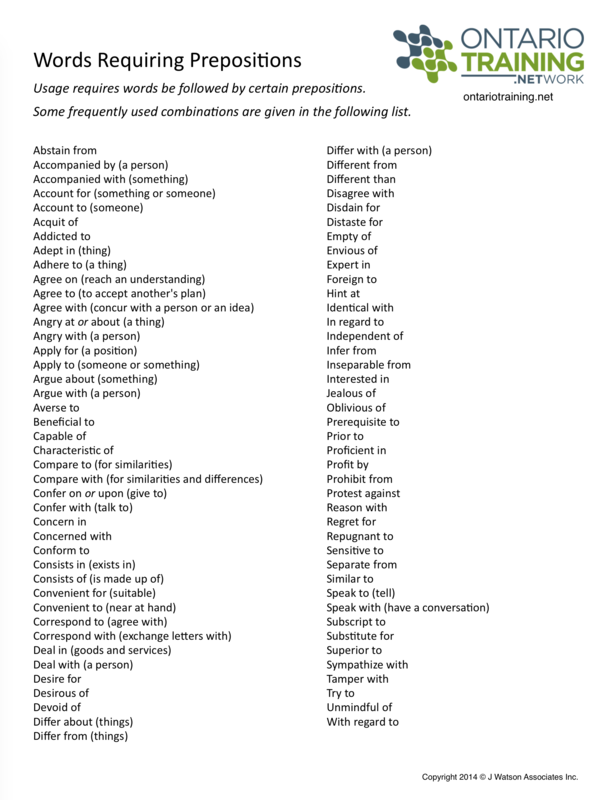 When writing a report, I start with an objective matrix. I divide a page into three columns. In the first column, I list everything I know about my readers with regard to their current knowledge of the topic, attitude, constraints, desires, etc. I call this B1 – the current belief. I then move to the third column and list what I want the readers to think and/or do after reading my report. This is the B2 – future belief. Now for the middle column. This is where I place all the details readers have to know to shift them from the B1 (current) to the B2 (future) column. For example, if I wanted to convince a reader to adopt an in-house writing program, in the B1 column I might put the number of staff who write to customers, any problems that have occurred, and any concerns about company image and time spent in writing. Remember this column is the current situation. It details what the reader knows now. It will form the introduction for the report. Moving to the B2 column – the third one, I would summarize the program I want to run and its content, who should attend, and when ideally it should start. This will form the conclusion section. If I wanted approval for a supplier or a tendering process, I would include that as well. Remember, this column is all about the knowledge you want the readers to have or the specific action you want them to take as soon as they have finished reading. Never write any business document until you are clear as to your desired outcome. So what do I need readers to understand so they will move from the B1 to B2? In the middle column, I would make a note to include the details of the writing program, attendees, benefits, delivery, logistics, timing, projected costs in my report. If I wished a specific vendor, I would jot down all the necessary vendor information. If the report’s desired outcome was a tendering process, I would remind myself to include an outline of the process and the timelines. I would also consider any objections the reader might have with regard to the topic and make a note to defuse them in the report. I flesh out all these points when writing the document. Once you have started the objective matrix, give more thought to your readers. You have three types of report readers: senior management, experts, and users. If you are writing to senior management, their key interest is the bottom-line and/or market share. They don’t like a lot of scientific data, statistics, and jargon. Experts know as much if not more than you about the topic. They want jargon and calculations. Users are more comfortable with “how to” details and only a smattering of support data. Using this additional reader information, go back to the objective matrix to see if you can add anything else. A well thought out objective matrix ensures your report answers all your readers’ questions. It will also help you to avoid adding irrelevant information. Once your report is written, it’s time to make it reader friendly. Although business readers want all the necessary information, it doesn’t mean they will read the entire report. They skim looking for specific details. Therefore, add talking subheads. Talking subheads are different from subheads. A subhead is a place marker, i.e., Monitoring Visits. A talking subhead provides key information, i.e., How to Prepare for Successful Monitoring Visits. It can be anywhere from seven words to two lines. This technique allows readers to skim but also ensures they get key points. I like to insert a talking subhead about every five paragraphs. Remember if you are writing a lengthy report, all key points should be repeated four times: in the executive summary, the body, the introduction or the conclusion, and in a subhead. Jane Watson is a trainer, author, and consultant in the field of written business communications at Ontario Training Network. She offers courses in report writing: Report Writing for Council and Report Writing Toolbox.